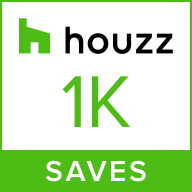 Do you get a kick out of those remodeling horror stories? Then stop reading because this is more of a remodeling fairy tale! It all begins in a not so far away land near Lake Geneva. A stately but dated home starts it’s transformation at the entry by correcting a medieval door which was completely exposed to the elements. (While medieval works in fairy tales, it’s not ideal for a lake house.) 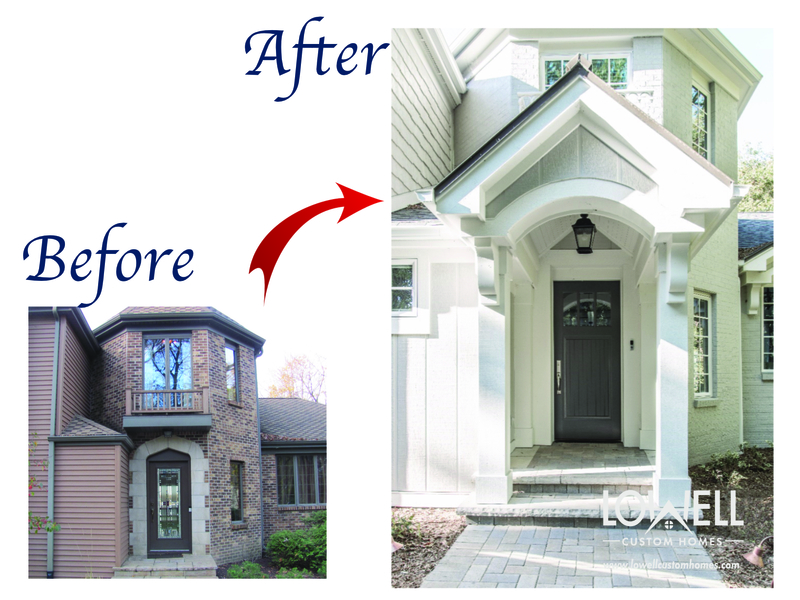 A new welcoming covered porch completes the front elevation with other gracious architectural details. On the interior an equally impressive makeover was in progress. 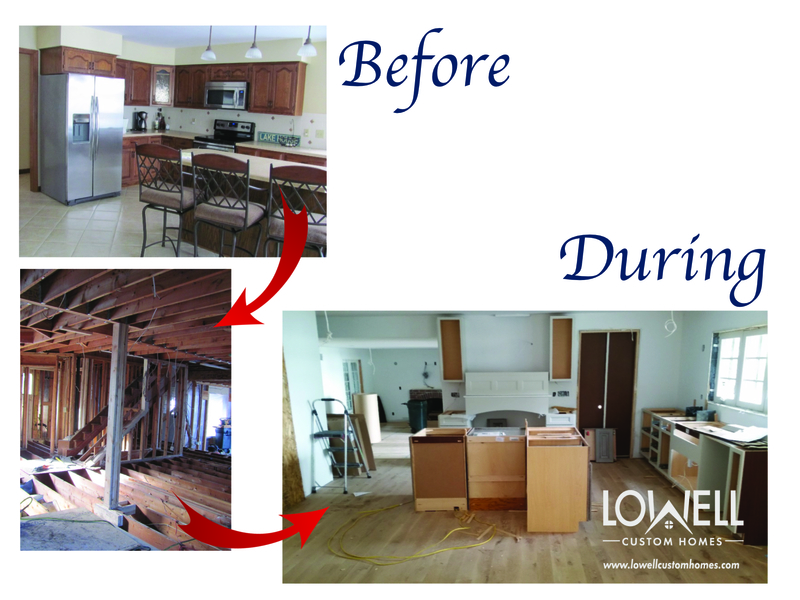 In the kitchen, walls were taken down to open up the space to the family room. 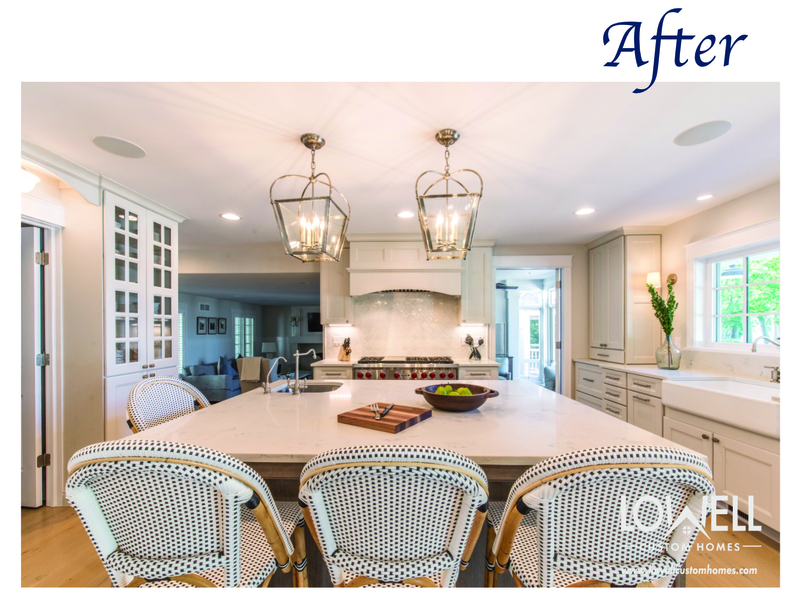 The dark 80’s oak cabinets were replaced with bright white and gray painted cabinetry from Medallion Cabinetry with kitchen design by Geneva Cabinet Company. A small walk-in pantry flanked by two tall glass-front cabinets provide additional storage and eliminate the need for wall cabinets in order to maximize lake views. Meanwhile the formal living room was taken down to the studs. 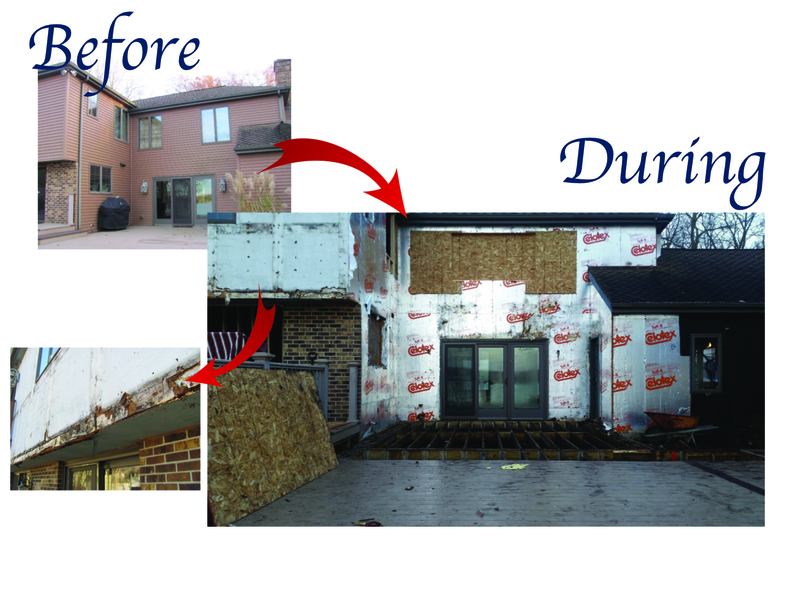 The load-bearing wall was removed and a new I-beam installed. 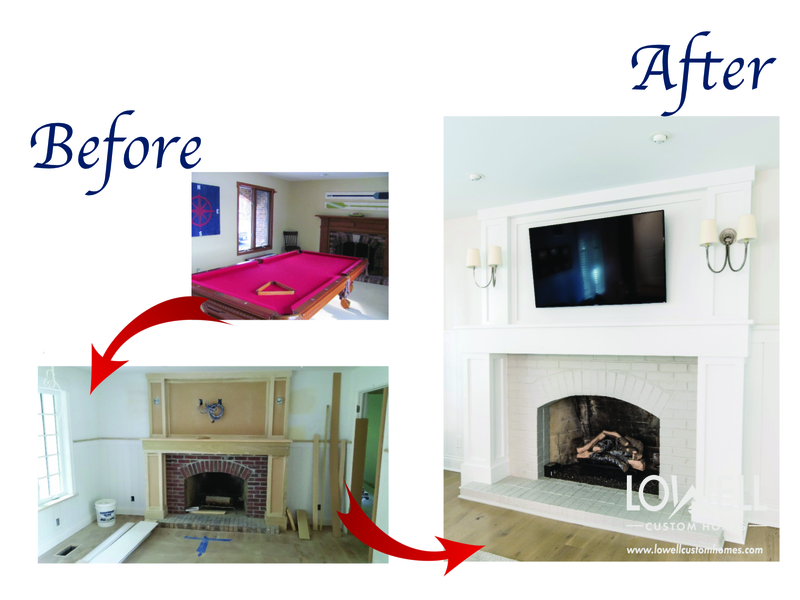 The fireplace was trimmed to the ceiling and the dark brick painted pale gray. On the second story the guest bedroom had a ceiling that was just too spectacular to remove. We preserved it and updated it with high gloss white paint for a fresh look in keeping with the new character of the home. 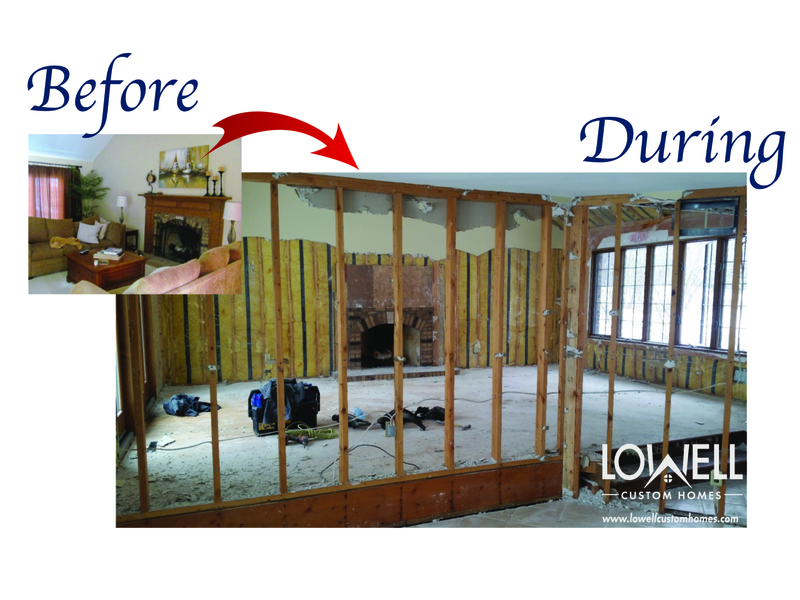 All drywall and floor sheathing on this 2nd floor was replaced before new wool carpet was laid. 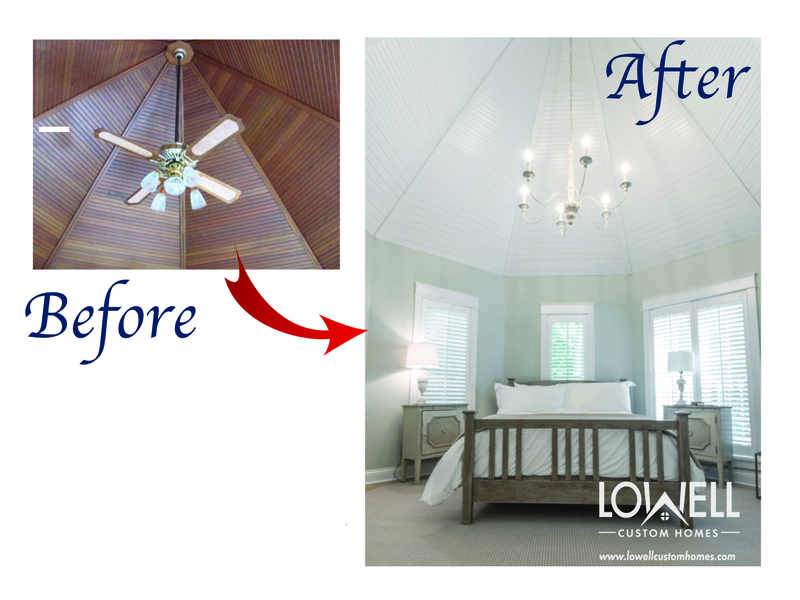 The crowning accent was a delicate chandelier to replace the tired ceiling fan. 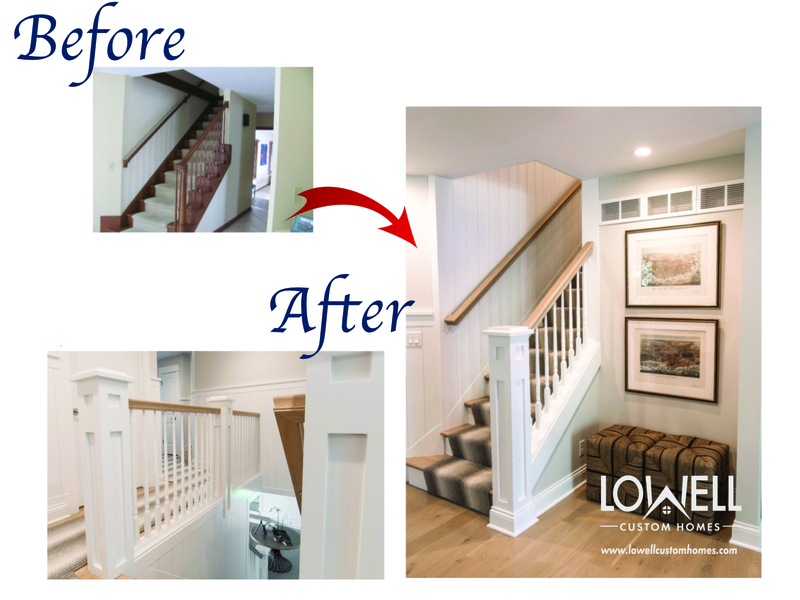 The family room and staircase were not neglected during this enchanting makeover. But the real drama is saved for the lake side elevation of the home’s exterior. More than a cosmetic makeover was needed. This exterior suffered damage from water that had seeped in under the siding and all soffits and facia. 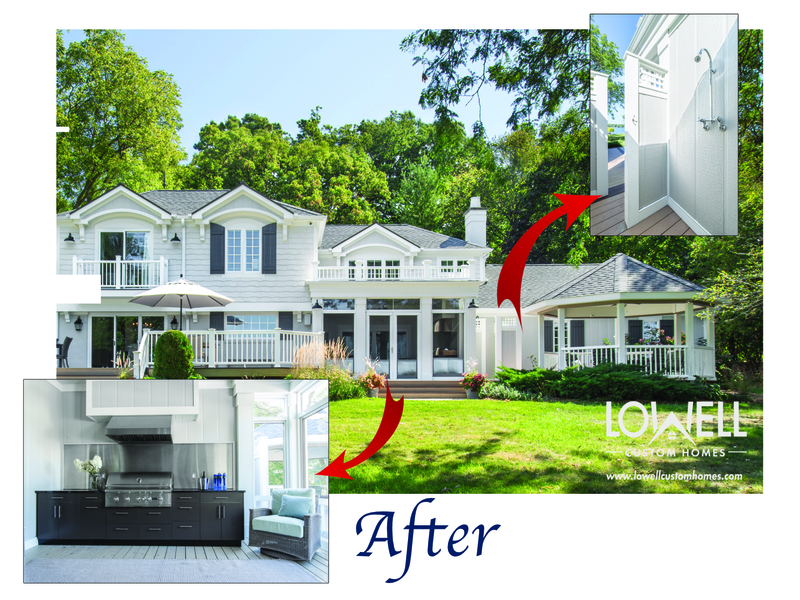 Once repaired a screened porch was added to the back of the house with access to the family room and kitchen. This allowed for a balcony off of the 2nd floor master bedroom. A delightful outdoor kitchen by Danver was added to complete the lakeside living space. 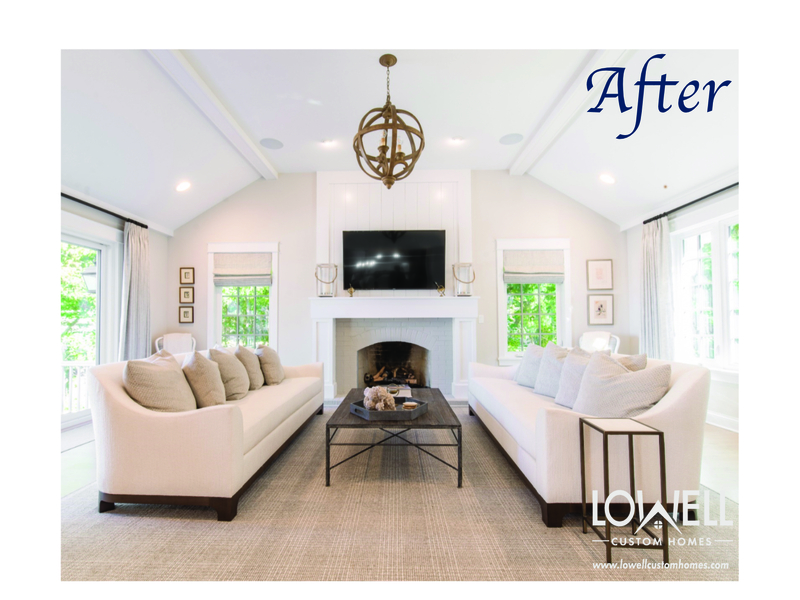 We are happy to report that homeowners and the entire Lowell team lived happily ever after! 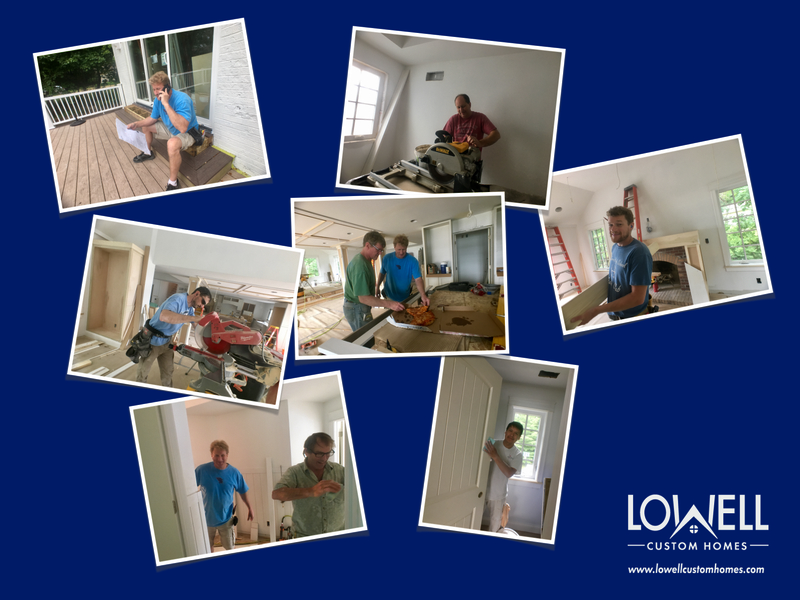 Special thanks to our homeowners for the pleasure of working together (and the pizza parties) ! 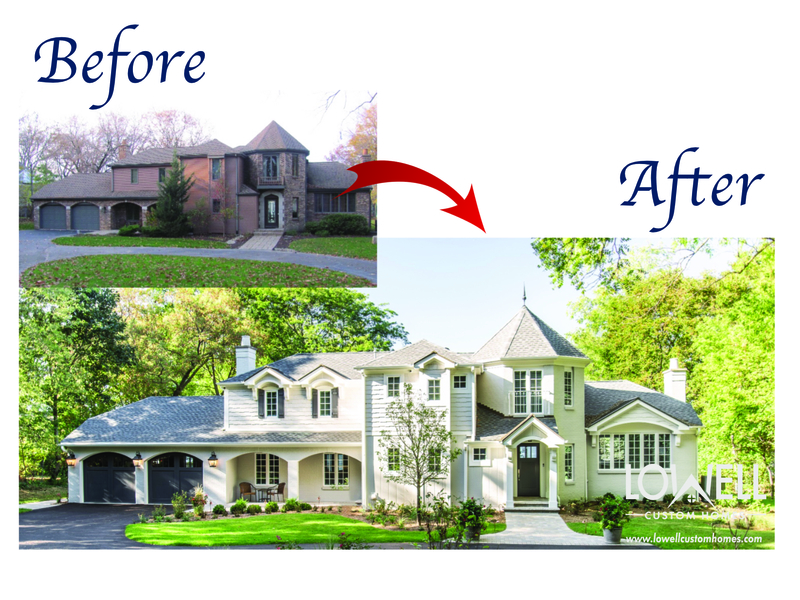 When it’s time to build or remodel, just ask us how you can create your own fairy tale ending.